MUTANTs around the world have been asking us to create a whey protein isolate shake — and we listened. 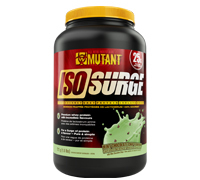 Formulated with high quality ingredients, MUTANT ISO SURGE is our NEW fast-acting Whey Protein Isolate & Hydrolysate formula with sinfully delicious flavours. We invested huge amounts of time and care crafting these flavours in our lab with MUTANT athletes involved in the taste-testing process! We're now ready to share these exciting flavours with you. A surge of protein plus a surge of flavour — that's the ISO SURGE one two advantage...pure and simple. We're confident that ISO SURGE will be your go-to choice for all your whey isolate needs. ENJOY THE SURGE! Mint Chocolate Chip Flavour Shown. Ingredients may vary from flavour to flavour. 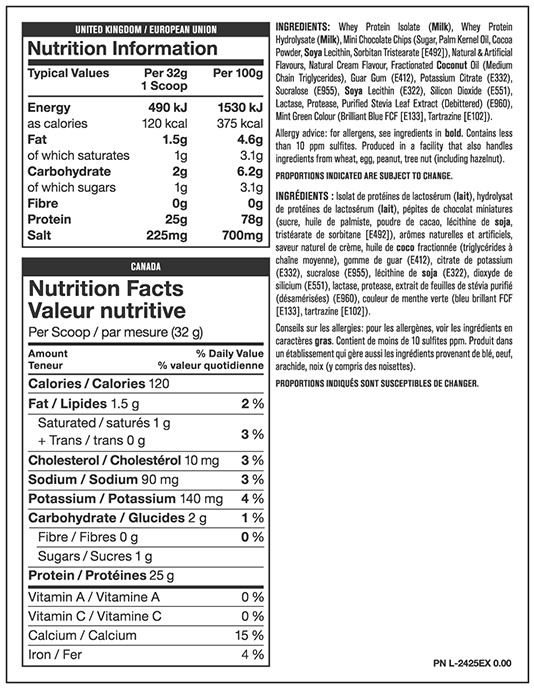 Ingredients: Whey Protein Isolate, Whey Protein Hydrolysate, Contains 2% or less of: Natural & Artificial Flavors, Natural Cream Flavor, MCT Oil (Medium Chain Triglycerides from Fractionated Coconut Oil), Guar Gum, Potassium Citrate, Sucralose, Lecithin, Silicon Dioxide, Lactase, Protease, Stevia Leaf Extract (Rebaudioside A) CONTAINS: milk, soy (lecithin), tree nut (coconut). Produced in a facility that also handles ingredients from wheat, egg, peanut, sulfites, tree nut (including hazelnut). Directions: Mix 1 scoop with 150-180 mL (5-6 fl. oz.) of cold water or milk.